In contrast with the Boys in Green’s largely predictable line-up, the Welsh side had a fresh look about it. Ireland's Callum O'Dowda dejected after the game. IRELAND MANAGERS HAVE a history of outstaying their welcome. With the benefit of hindsight, there have been instances in most previous coaches’ tenures where they suffer such a poor result that it almost seems as if the team is damaged irreparably because of it. In each of these instances, the manager has clung on to their job for a period thereafter, until it becomes starkly apparent that the team are unable to recover. For Jack Charlton, it was the embarrassing 0-0 draw with Liechtenstein. For Steve Staunton, it was the devastating 5-2 loss to Cyprus. And for Giovanni Trapattoni, it was the comprehensive 6-1 defeat against soon-to-be world champions Germany. In each of the situations, both the manager and the team would have been better served parting company, but instead desperately clung on to prolong the pain for all concerned. The 5-1 World Cup play-off loss to Denmark last November had a similar feel — as if O’Neill had taken the team as far as he could and as if something was broken that could not be fixed under the current regime. The 66-year-old coach seemed to have the perfect chance to leave thereafter, with Stoke showing strong interest in making the Derry native their manager. Instead, he stuck with Ireland, penning a contract extension, which he may well be ruing signing now. It was meant to be a new campaign and a fresh start for Ireland and O’Neill, but instead it seemed like the end of something. It’s 23 years since Aston Villa beat Man United 3-1, prompting Alan Hansen to famously declare “you can’t win anything with kids”. Of course, the former Liverpool defender’s quote was made to look foolish when the Red Devils went on to claim the title at the end of that season. Both Roy Keane and Ryan Giggs were part of that United squad (though Giggs didn’t play in the Villa match). And Hansen’s ill-advised remarks sprung to mind in Cardiff, as many of Wales’ kids eclipsed Ireland’s veterans, with Giggs’ team rather than Keane’s Ireland far more in tune with the philosophy and style of Fergie’s Fledglings. O’Neill may have handed a debut to Callum Robinson, but the Irish team overall had a familiar look. Despite a number of players out injured, the likes of Jon Walters, Seamus Coleman, Stephen Ward, Ciaran Clark, Darren Randolph and Jeff Hendrick all have plenty of experience at this level. By contrast, Wales, including subs, fielded no fewer than three teenagers – Tyler Roberts, Ethan Ampadu and Matthew Smith. Meanwhile, David Brooks (21), Connor Roberts (22) and Chris Mepham (20) are all not much older and similarly unaccustomed to playing on such big occasions. It must be said too that they had the benefit of a world-class player, Gareth Bale, showing close to his best form. And the hosts’ inexperience was hardly evident, as they bossed proceedings. They played the kind of scintillating football that the current Ireland side can only dream of, with the 4-1 result a fair reflection of the gulf in class between the two teams on the night. When quizzed about his unwillingness to experiment and trust in youth in the way Giggs clearly has, O’Neill recently insisted that his remit with the national team has been to win football matches rather than to focus on building for the future. Yet the two are surely not mutually exclusive, as the Welsh side proved. That said, even if another man was in charge and the Irish team was full of inexperienced youngsters, whether they would have performed significantly better is debatable. As tempting as it is to find a scapegoat for these kind of demoralising defeats, you get the sense that there is no quick-fix solution. While there are a number of players with potential at underage level, the age profile of the team and the fact that a 34-year-old Jon Walters who is clearly lacking match fitness was forced to toil ineffectually up front on Thursday evening for 90 minutes is indicative of much more wide-ranging problems within the Irish underage system. This point does not totally excuse the team’s sheer ineptitude, of course. Even limited sides can go far in international football with the correct gameplan and tactics, but in Cardiff, Ireland made life far easier than it should have been for their opponents, owing to a defensive vulnerability, a midfield that was invariably overrun, an attack that scarcely threatened and a tendency to make individual errors frequently. 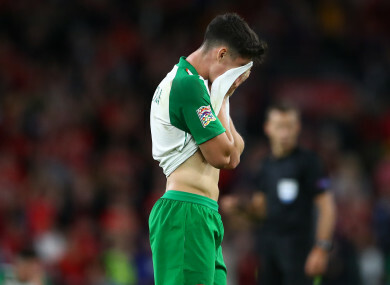 While it can surely only get better from here, having conceded nine goals in their last 180 minutes of competitive action, the deep-rooted problems in Irish football won’t go away anytime soon. The good results of Noel King’s U21 sides and the U17s back in May suggests there could be better days to come, but for now it seems the team are stuck in a worrisome situation than no one player or manager can adequately resolve promptly. Email “Bold, youthful Wales blow away lumbering Ireland”. Feedback on “Bold, youthful Wales blow away lumbering Ireland”.